We began by cutting long strips of brown packaging paper, ironing them out and then folding them to create a bi-fold card with a side pocket. 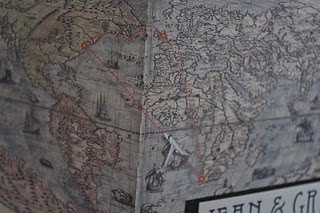 Next we found a 16th century map online and used Photoshop to superimpose a picture of a plane with travel dots forming a heart from NYC, London and Capetown (where we each lived and met respectively). 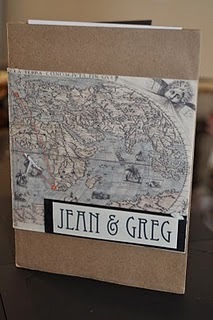 The map was wrapped around the card and we glue gunned an embellishment of our names on the front. Inside we glued the invitation onto black placard on the right side and in the folder we inserted the RSVP card and reception card. 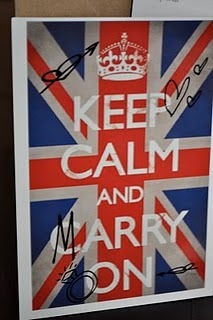 The RSVP card we made by printing a picture of the "Keep Calm and Marry On" logo, graffiting it to say "marry on", rescanning it back in and then getting it printed on postcards. For the reception card we found a 1930s subway map and superimposed a cross and crossed champagne glasses in the map key and on the map to indicate where the ceremony and reception were being held. 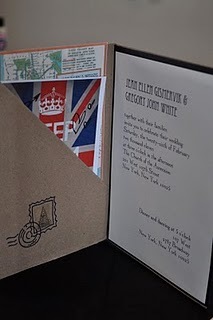 On the back we put the ceremony, reception, and travel info. 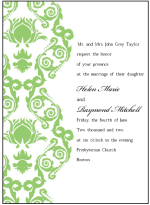 We made the reception card small and thin enough to carry in your pocket like a pocket subway map. Join in and write your own page! It's easy to do. How? 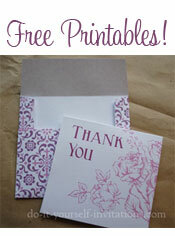 Simply click here to return to DIY Wedding Invitations.